I am the world’s number #1 fan of vintage wallpaper for midcentury homes. I think it is wonderful to warm up a foyer… it’s great in a guest bath… and for the kitchen: Yes! Honestly, once you start with the wallpaper, it’s kind of hard to stop. You know how you can’t be “just a little bit pregnant”? 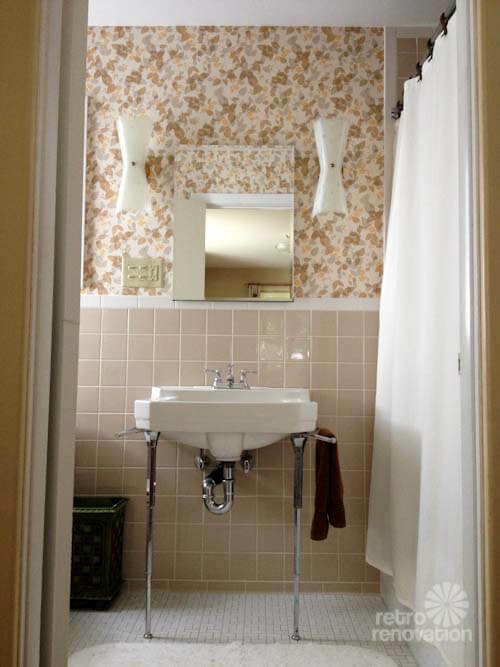 Similarly, it’s difficult to add “just a little bit of wallpaper.” There are several spendy “go-to” places to buy vintage wallpaper in the U.S. I’ll list them here. But in this “Retro Renovation 101” post, I also will share how I found some of my gorgeous wallpapers for as little as $1.25 a double roll. Rosie’s Vintage Wallpaper: Fun fun fun. Most rolls cost about $95/roll. Hannah’s Treasures: Fun fun fun. Looks like $85 or $95 for most rolls. Secondhand Rose: Website is a pain. New York City prices $100, $150 and even $200/roll. The key to ebay shopping is search terms, and tenacity. I am nuts for vintage wallpaper, and my Saved Search says: “vintage wallpaper rolls”. I put that word ROLLS (plural) in there, because I don’t want to see single rolls, of which there are multitudes. 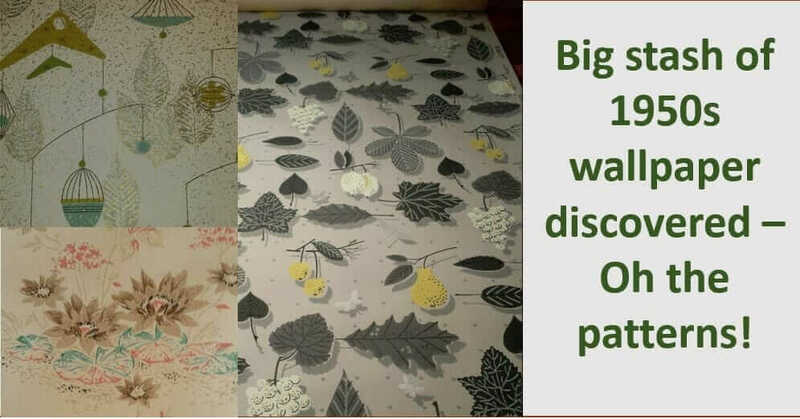 If you are really truly madly deeply on the hunt, make up multiple searches, such as: Antique wallpaper, midcentury wallpaper, 1940s wallpaper, 40s wallpaper, etc etc…. Also, once you find a seller who seems to deal in this stuff save that sellers’ searches as well. One more ebay tip: If you see flashes of goodness, go down that seller’s rabbit hole. This takes a lot of Time. I found this vintage wallpaper super cheap — like $1 a roll — at an estate sale a few years ago. I found and purchased dozens of fantastic rolls of vintage wallpaper from a local store in the next town over that had been in business since the 1950s. Over the years, they had transformed to sell art supplies and had phased out their wallpaper business. I saw some vintage rolls on display — they were selling it for craft projects — and simply asked, Is there more? Yup. Owner Steve took me down to the basement, where my head started to spin and my fingers started to itch, I couldn’t slap that credit card out fast enough. 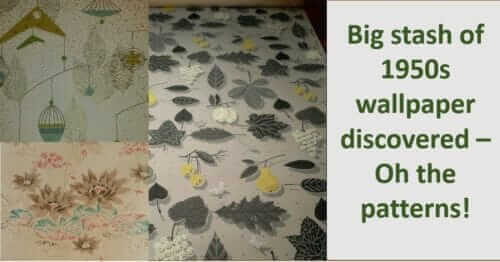 I created a patchwork of vintage wallpaper in my crazy office remodel. 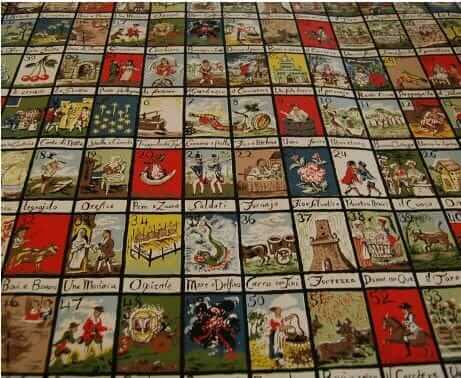 I have used a bunch of this wallpaper throughout my house, and I am hoarding the rest. Because I have an attachment issue. Also, because I think *some day* I will have a use for it. Bottom line: Think about it and then stalk (nicely) your local old-time stores to see what stock they may have forgotten about and would be happy to get rid of. Run to the basement of estate sales. Then the attic. Then the closets. You may find some there. I found 10 rolls of this vintage wallpaper for $8 total at an estate sale last summer! This past summer I scored 10 rolls of the absolutely gorgeous pink-gold-creamy-gray design wallpaper (above) at an estate sale for $8. That’s my 80 cents per double-roll best-price-of-all-time find — and the photo does barely scratched the surface of this paper’s beauteousness. It was in an upstairs bedroom, in a box, probably pulled out of a closet, it was 100 degrees up there, and the box was horrifically dusty and very off-putting. But not to me. Fear dirt on your hands, and you will go home empty-handed. 5. Search for vintage wallpaper with a “wanted” ad on craigslist or in your local newspaper. Okay, here’s one last idea: Put a “wanted” ad in your local newspaper and/or on craigslist. When I was looking for a bathroom sink about eight years ago, I found it by placing an ad in my local newspaper. I live in the kind of market where that could work … it’s a tight community and back then, at least, “everyone” read the newspaper. Today, I would start on craigslist, though, because all listings are free and because craigslist is so much more well known. Lots of folks read these ads with great intensity — maybe yours will catch their eye, causing them to remember, “Hey! I have some of that in my basement!” That’s exactly what happened with the person who saw my ad for a sink. I bet that, event today, there are thousands of rolls of vintage wallpaper stored in basements and closets of America — waiting to strut their vintage stuff for YOU! Do you love wallpaper as much as I do? See all my stories about wallpaper — vintage and retro-new — here. Colefax & Fowler printed “Berkley Sprig” for years; it was their logo paper. Discontinued just when I needed it! Any ideas? 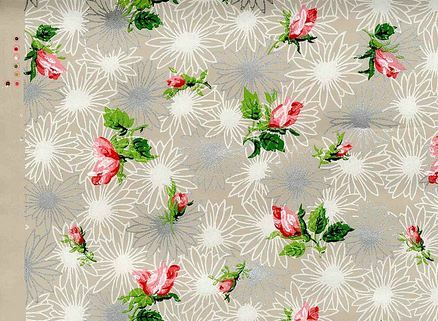 Or where to find old Brunschwig et Fils Williamsburg reproduction papers? Our 1840 stone house needs lots! Have you tried Thibaut’s heritage collections? I’m not sure if they still make them.